27 years and still kicking. We have survived the bad times and look forward to the future. While some of our counterparts have closed their doors, we continue to service the community. We have taken on new flooring trends and are excited to be installing them. The LVT (Luxury Vinyl Tile) business has grown in leaps and bounds. We are proud to display multiple racks to browse through. We also feature many samples of porcelain wood look planks. Both of these products have proven very serviceable and an asset to our business. Although we are working somewhat less…. Bill is not installing as much as he once did and Cindy takes off a few days a week to babysit their grandchildren, we are relieved to have a great office staff and multiple talented installation crews. Our people have been with us for years and we look forward to years to come. On the home front: It is wonderful that our three children have decided to stay and raise their families in NEPA. We are so happy that they are an active part of our lives. 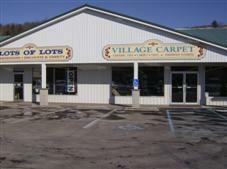 The new stores have been rebuilt and we are pleased our tenants are also able to run a small business and succeed. We aim to help all new small business’ begin (as we once received the generosity of our first landlord).